How does it feel like to wear powder lipstick when you have dehydrated lips? Ask Me! Please! I'm the best person to answer! 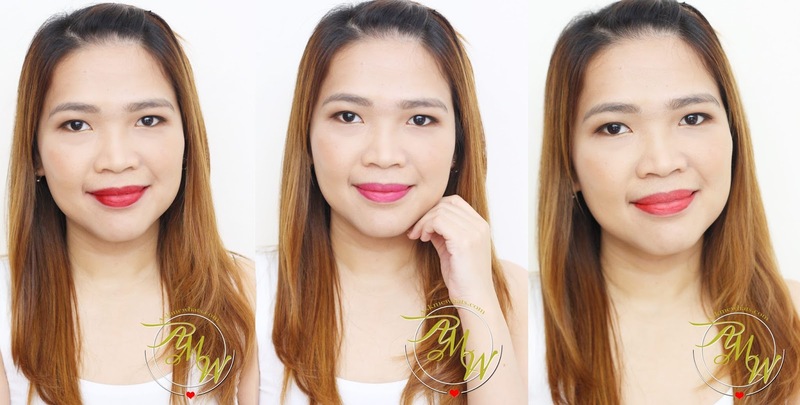 I got 3 shades of the FIRST Powder Lipstick from L'Oreal Makeup Designer/Paris, I tested them out immediately and here's what I have to say! Firstly, the packaging is oh-so-chic and amazing! I can't help but smile whenever I pick these up! With all the Japanese characters on their "plastic" cover, I knew they are either meant for Japanese market or made in Japan. Wherever it is made, they've done a great job! You get a gradient effect of the lip powder color on the packaging making this an easy-to-grab lip product! The 3 shades that I got are (L-R) Orchid Blossom, Tulip Blossom and Plum Blossom. There are a total of 8 shades and the last 5 shades are: Sakura Blossom, Rose Blossom, Lily Blossom, Peach Blossom and Peony Blossom. Tint Caresse, as the description states, is a lipstick in powder form. You get nothing but pure pigment of the lip color and it gives out a matte finish. Use as a mattifying powder on top of your current lipstick to transform the finish to matte. Create ombre lips, for Korean gradient lips effect. As for me, I prefer to use this on its' own as a powder lipstick. Application is easy, I just dab starting from the center of my lips then gently fill in the rest. As much as I would love to "Mattify" my lipstick using these, I prefer not to as I don't want to mess up my sponge-tip applicator and I want to keep it try. Now, what's the difference of a powder lipstick and a regular lipstick? Powder lipsticks are highly-pigmented, because you get nothing but pure pigments. I assume they will also be transfer-resistant and budge-proof, because for the fact that creamy products will help lip product slide off easily or transfer easily. Lastly, I can honestly tell this will be the most lightweight lip product as of date! Feels extremely lightweight, almost air-like. All these are extremely pigmented but when worn by user who has extremely dry and feathering lips, there will be moments when the dryness will show (Due to the extra flakes on the surface of the lips). I usually apply a thin layer of lip balm after L'Oreal Tint Caresse just to give my lips a bit of moisture. Or better yet, exfoliate your lips prior to application! Tulip Blossom is a true orange red lipstick! As always, my warm skintone doesn't go well wearing orange based lip color! But what the heck? I can always mix this shade with the next color to be featured --- Plum Blossom! On packaging, Plum Blossom looks brown but once applied, it gives a beautiful deep red shade! Now if you ask me if they last longer than regular lipstick? I would say YES! Maybe an hour longer? Because the powder adheres to the lips so well it stays longer! Another quick tip is that, these pigments can also be used as blush color! Give it a try when you're out and you are desperate for a cheek color! This may work, but you have to apply sparingly and set with loose powder! My heart says Orchid Blossom (Pink). Tint Caresse is now only Php350.00 from the original price of Php500.00. Find yours in L'Oreal Paris Makeup counters in leading department stores, personal care stores and online retailers nationwide. You're funny! why are you apologizing? I actually got "kilig" when I read "I love you more"...pero with Tulip Blossom pala, but nevertheless, thanks for loving me! in ANY shade of lippie :D great monday! Love the orchid blossom. In fact I have a lancome lippie that is almost the same shade. Hi ate Nikki :) They're all gorgeous shades, but Orchid Blossom flatters you the best! WOW, these are stunning! And the dispenser looks just... so easy to use! The pink (orchid) is my favorite. agree, but I wonder til how long I will use it :D I can't seem to know when will the product be used up!